This is a convenient make-ahead salad. Great for summer gatherings, meal prep, or work lunches. Nothing in here will wilt, and the flavors will meld together even more. Everyone will love the vibrant colors and fresh taste! Usually I’m pretty good at spelling, but geez, the word “Mediterranean” had me so stumped that I not only had to look it up like 5x, I ended up copying it straight from Google into this post so I didn’t have to type it out the first couple times. Yikes. Some words do that to me… what can I say? So. This Greek chickpea salad. This Mediterranean chickpea salad comes together in about 15-20 minutes, and you don’t need to cook anything. A little chopping is all that’s needed. Easy peasy. The feta and chickpeas make this salad fairly filling, so it feeds 2 as a light meal or 4+ as a side. Will you make this easy chickpea salad? Hope you enjoy this Mediterranean garbanzo bean salad! Drain & rinse your chickpeas and add them to a salad bowl. Prep your veggies and herbs, and add them to the salad bowl as you go along. Add the dressing ingredients (olive oil, lemon juice, garlic) right into the salad bowl and toss gently. If you can't find feta that's packed in oil and herbs, any feta will work fine. Also, don't worry about it being exactly 3.5 ounces... that was the size package mine happened to come in. Love these flavors? You may also enjoy my Mediterranean orzo salad, my Mediterranean quinoa salad, or my avocado Greek salad. Our annual picnic. I trust you’ll be making this for me? That looks amazing!! Could I serve this on a bed of romaine? Mmmm…I love me a good Mediterranean salad! And bonus- no cooking in the summer! Love it! That’s great! So did I as a kid. Hope they enjoy it! How pretty is this! So full of different colours and flavours, I’ll definitely be trying this. Ahhh I saw this on your insta yesterday and just had to come see the rest of the photos on your site. Gorgeous!!! Lol! I swear we are sisters from another mister, because OMG, I can totally relate to some words just stumping me. It’s like, I know how to spell them, but sometimes my brain just doesn’t want to work. 😉 OR, have you ever written a word so many times that it just starts to look wrong? Anyways, I am LOOOOVING this salad! 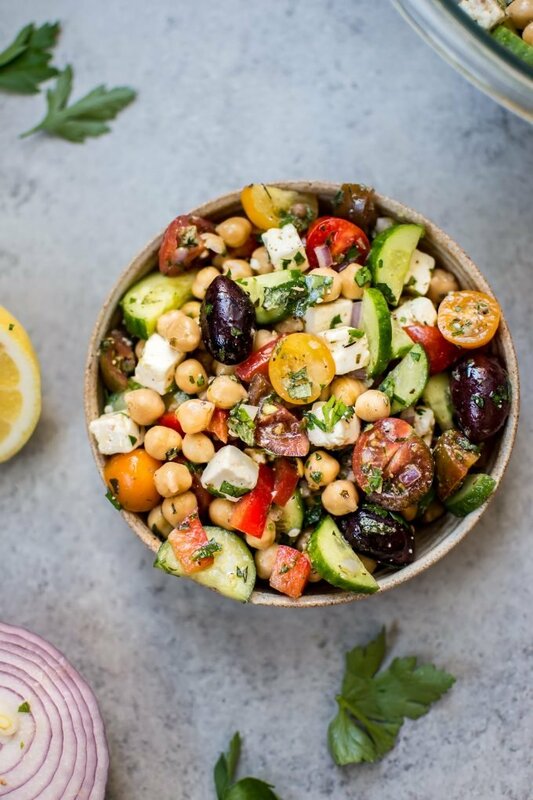 Chickpeas are LIFE and I’m all for Greek (or Mediterranean) anything, so this salad is screaming my name! I could definitely eat this on repeat! Cheers, dear! YES… I totally do that… then you’re like is this even a word?? Hahaha thanks… yes I’m all for Greek/Med. as well. Mediterranean always stumps me too. For some reason I always want to add two ds, then I can’t figure out why there’s a squiggly red line under it. It looks right to me, spell check! But oh, this salad! Chickpeas are one of my staples and I loooove the whole Greek flavor profile. I’m sooo making this soon! Happy Friday-eve, Natasha! Hahaha! I’ve finally found someone else who struggles with the word Mediterranean (←←thanks autocorrect), I’ve usually got it copied so I can paste it into my post whenever I need it. The same goes for Moroccan (is it one R and two C’s , or vice versa?). Gorgeous looking salad! This is such a delicious looking salad. I love chickpeas and this is a beautiful way to use it in a salad. Thank you, Ashika!! Hope you love it. Can not wait to try it! Thank you for the recipe. Would I be able to make this without the feta cheese? Thank you! Sure, leaving the feta out wouldn’t be a problem. Hope you love it! Can I have the nutritional value for all you recipes please? Hi Sandra, sorry, I don’t have that info. You ought to take part iin a contest for one oof the ggreatest blogs on tthe internet. I’m going to recommsnd this blog! Making this today it looks so good and I have all of the ingredients! Can’t wait to try it!